For our invitations, we wanted something that would really WOW everyone and also get them in the mood for a fun destination beach wedding. So fun! I know what I have written below looks like a lot, but these invites are really simple and FUN to make! I just want to be as detailed as possible so you can recreate this look if you want. HAVE FUN! I wasn’t able to find this size bottle at any of the craft stores in my area. Or boxes. I did however find bottles AND boxes from http://www.sandartsupplies.com/ for a reasonable price + S&H. I found these at Michaels right next to the sand. Brand: BLUE MOON BEADS: “Tokens” and “Lost & Found” designs– sold at Michaels. Each of these packs come with 6 designs. - Fill each bottle with 3/4 inch to 1 inch of sand. - Drop in a variety of seashells – however many you need to make it look nice. I filled each bottle with 1 to 2 “big” shells (whatever would fit in the small bottle opening) and then filled it up with smaller shells – different styles, colors, etc to give it variety! - Wrap the hemp cord around the neck of the bottle, weaving the ends of the hemp cord through the charm and back again as many times as the charm loop allows. Tie a knot (under the charm). Two hemp cords will now dangle under the charm. String the glass beads onto the hemp cord and when you have as many as you want, tie two knots to secure the beads from falling off. Do the same for the second piece of hemp cord. - On the backside of the bottle from where the charm is, you will want to secure the hemp cord to the bottle – otherwise it will slide off as the neck bottle tapers. I used Gorilla Glue since that is all I had laying around the house and it worked great. I used a small paint brush (it will get ruined so use a cheap one) to lightly brush glue onto the glass/hemp. I left it to dry overnight. 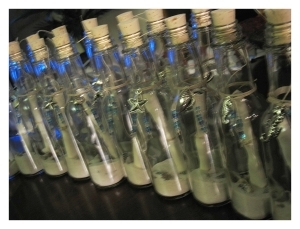 - The bottles are done! Now time to add your invites!!! - Parchment paper if available. I used some premium quality paper I had laying around that I was using for resumes earlier in the year and it turned out great! 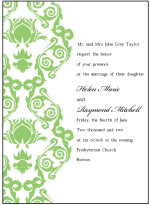 - I designed the invitation to be approx 4 inches wide and 5 1/2 inches long. 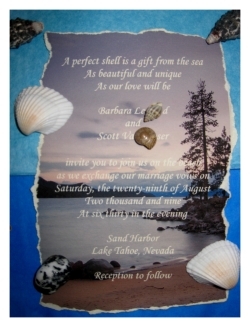 - I found a cool image on the internet of Sand Harbor (Lake Tahoe Beach Park) and used that for the background of our invitation. and filled in all the other important information an invitation should have. As of yet, we haven’t found a reception site, otherwise I would have included a really cool map to the site. I definitely recommend making a “treasure” map. I was in a rush to get the invitations out so I had to do without it. 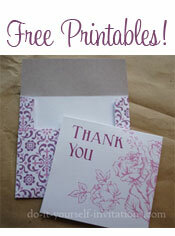 - After printing out the invites, tear the paper along the border to give it a worn/weathered look. You can brown the edges too if you’d like. - Roll up the paper into a small scroll and secure with the hemp cord. Make sure to leave about 5 1/2 inches to 6 inches of the cord to hang outside of the cork a little bit. You want your guests to be able to pull the invite out of the bottle. - Drop the scroll into the bottle and secure with the cork. - The really cool thing about the boxes we ordered along with the glass bottles is that the boxes were MADE FOR the bottles. Your message-in-a-bottle will fit snuggly in the box. I used two shades of blue tissue paper inside the box to represent water. If you’re concerned about breakage, you could always use bubble-wrap or Styrofoam.